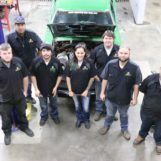 GARDEN CITY, Kan. — The Automotive Technology program at Garden City Community College will host an Open House from 2:00 p.m. to 4:00 p.m. on Friday, April 26. Guests are invited to tour the Automotive Technology Shop, meet the instructors, gather information about the new cohort-style organizational structure of the program, and enjoy light refreshments. First-time applicants interested in starting the Auto program in 2019 are encouraged to apply by April 26, in order to be eligible for the Freshman $500 Scholarship drawing through the GCCC Admissions Office. Space in the Fall 2019 Auto Tech cohort is limited. The Automotive Technology Shop and classroom is located in the Southwest corner of the John Collins Vocational Technical Building at GCCC. For more information about the Automotive Technology Open House or application to the Auto Tech program, contact Instructor Ryan Grubbs at ryan.grubbs@gcccks.edu .